(by Elizabeth Shim, UPI) Jan. 16 — A native Japanese sumo champion is retiring from the sport following a number of losses in the ring. Kisenosato Yutaka, 32, had suffered consecutive losses, including most recently against Tochiozan Yuichiro during the New Year Grand Sumo Tournament in Tokyo on Wednesday, Mainichi Shimbun reported. The defeat comes only two years after Kisenosato became grand champion, or a “yokozuna,” becoming the first Japanese wrestler to attain the status in 2017 in two decades. Kisenosato’s retirement means only two elite-level wrestlers remain in the sumo-wrestling world. Both athletes hail from Mongolia, according to the BBC. The sumo champion initially notified the public of his retirement through the Tagonoura stable. The sumo athlete also said he is “upset” he was unable to meet spectators’ expectations but that he also has “no regrets,” Japanese press reports stated. Kisenosato will be adopting a new name, Araiso, as a sumo elder. He will turn to coaching up-and-coming wrestlers, according to reports. The athlete, whose real name is Yutaka Hagiwara, debuted in 2002 and reached a top division in 2004 at the age of 18. Sumo wrestlers undergo rigorous training, and must adhere to a strict diet that helps them maintain an ideal weight of 400 to 600 pounds. (By James Gordon, Daily Mail, Jan. 21 2019) – A bald eagle ended up stealing a fisherman’s first catch and it was all caught on camera. 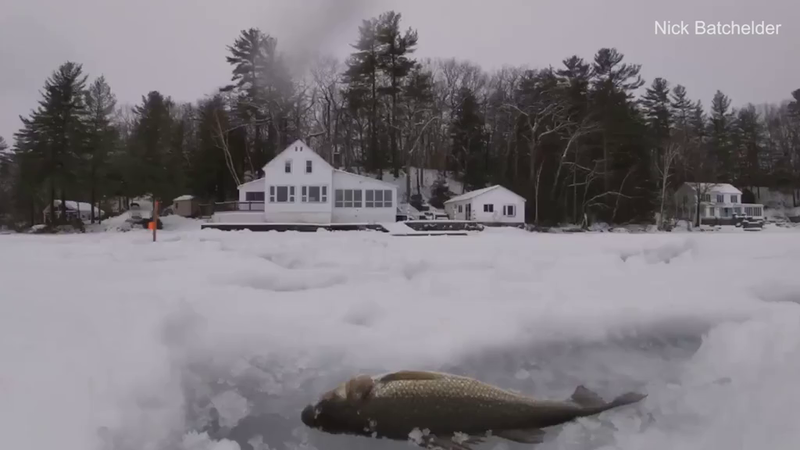 The fresh fish was lying on the ice in Windham, Maine, while the angler continued to fish. The sharp-eyed eagle had other ideas – and seeing the freshly caught meal ready for the taking, it was hard to resist. The eagle had been eyeing the fishing party from up above and was waiting for the right moment. Batchelder set up his GoPro camera and set the perch out on the snow to encourage the eagle to come closer. The three friends backed away from the fish, and the eagle flew down and made off with the fresh catch in its sharped hooked claws which did an excellent job of carrying slippery fish.